Sears has an odd way of showing its gratitude. Scroll down for more detailed image. 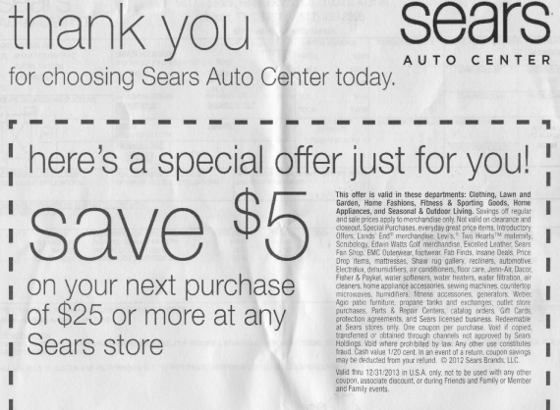 Consumerist reader Cliff recently received this coupon for $5 off any purchase of $25 or more from Sears. Seemed generous enough of the retailer. That is, until he looked at the manifold restrictions put on the offer. First, there are the bolded conditions of the offer being valid only in the following departments: Clothing, Lawn and Garden, Home Fashions, Fitness & Sporting Goods, Home Appliances, and Seasonal & Outdoor Living. Well, that still allows the coupon to be used for an awful lot of items at Sears. Except, there are many, many more conditions in the fine print. Sure, the coupon is good in the Clothing section, but don’t buy any Levi’s or Land’s End products and some other brands. And you can shop in Home Fashions, but don’t plan on saving $5 on a $600 Shaw rug or any brand of recliner or mattress. Home Appliances are good, unless you want to use the coupon on anything from Electrolux, Jenn-Air, Dacor, Fisher & Paykel, a dehumidifier (or humidifier), air-conditioner, water softener, water heater, water filter, sewing machine, countertop microwave, or home appliance accessories. And buy all the Seasonal & Outdoor Living products you like, except nothing from Weber or Agio, and no propane tanks. Our favorite is Fitness & Sporting Goods, where the coupon can’t be used on anything labeled a “fitness accessory.” One could argue that almost anything in this department would fall into that category. Let’s not forget the numerous other no-nos sprinkled throughout the coupon, like the fact that it’s not valid on clearance, closeout, Special Purchases (so special they need to be capitalized), everyday great price items (not important enough for the capital letters), Introductory Offers, Insane Deal, Price Drop items, exchanges, outlet store purchases, catalog orders, Gift Cards, and protection agreements. The numerous restrictions on this coupon are highlighted in yellow. We can understand why a store would put all these restrictions on a coupon with a larger discount, or a coupon where the discount is a percentage of the sale price. We could even see these restrictions being understandable at a store were there are many items under $25. But most of the items restricted by this list are well above that $25 threshold. 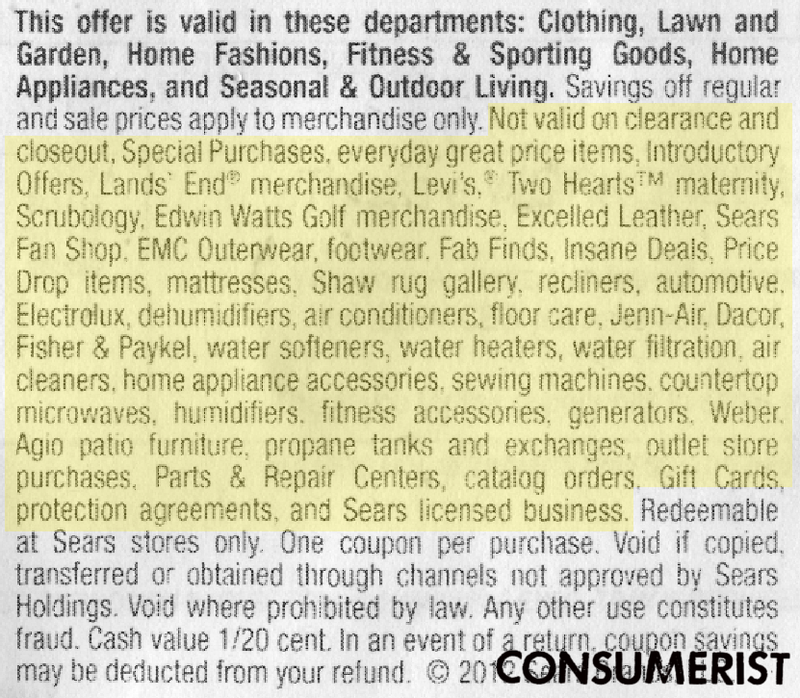 So Sears says “Thank you” to customers by providing them a $5 discount — a relatively common practice these days — that it knows can’t be used on a wide range of products. If Sears really wanted to thank customers by giving them $5 off, it would have just provided them a $5 gift card without any of these silly restrictions. For a store that is struggling to keep up with big box stores and online retailers, this is not exactly a great way to show gratitude to your customers.